Marine dogs and handlers await orders on Bougainville. War dog Caesar is at far right with his handler, Private First Class Rufus G. Mayo. In the Pacific, Americans warriors learned how to let slip the dogs of war. THE SEAS OFF BOUGAINVILLE were rough on the morning of November 1, 1943, and the beaches were cluttered with swamped landing craft. The first and second waves of the 2nd Raider Regiment threaded among the hulks, reached the shore of the largest of the Solomon Islands, and, against heavy Japanese resistance, began to push slowly inland. As the third wave of Raiders climbed into Higgins boats, they had unusual company. Crewmen using cargo booms on the attack transport USS George Clymer were lowering 24 dogs—“Devil Dogs,” the Marines called them, in an apt repurposing of their own nickname—one at a time into landing craft bobbing alongside. The canines, some swaddled in fatigue jackets jury-rigged as harnesses, took it all in stride, as they were trained to do. Marines equipped with carbines, extra canteens, leashes, grooming brushes, and cans of dog food clambered over the Clymer’s side to join their animals, and at 7:30 the boats began the 5,000-yard run to the beach. The four-legged Marines and their 55 handlers constituted the 1st Marine War Dog Platoon, led by Lieutenant Clyde A. Henderson. Most of the men had never seen combat, and their leader, a science teacher and amateur dog trainer, was so green that all aspects of military life bewildered him. “I hardly knew how to wear a uniform,” the Ohioan recalled. Much was riding on this experimental outfit’s performance. It was the first time an American armed service was deploying a large unit of dog teams in an organized tactical role. The Devil Dogs were treading on new ground. Aside from unit mascots, the Marine Corps had no real experience with dogs. To learn handling techniques a Marine team led by Captain Jackson Boyd, a well-known dog trainer and master of foxhounds, visited the army K-9 school at Fort Robinson, Nebraska, in late 1942. The group returned with 40 dogs, augmented with 20 animals recruited through the Doberman Pinscher Club of America. At Lejeune instruction started with three objectives: to teach handlers how to train and work with dogs, to teach the dogs basic obedience, and to match each animal to the job it was best suited for. “We had no manual,” war dog handler Robert Forsyth said. “Training was by the seat of our pants.” And so all hands—and all paws—learned both sides of the commands heel, sit, cover, stay, come, crawl, jump, and drop. Training then became specialized, with 14-week sessions on scouting or messengering. Animals chosen as scouts had to be smart, aggressive, and energetic. The syllabus described the scouting role: “The dog is trained to detect and give silent warning of the presence of any foreign individual or group. He will prove especially useful in warning of ambushes or attempts at infiltration.” Among the early recruits was Andy, more formally known as Andreas von Wiedehurst, a 66-pound black-and-tan Doberman from Norristown, Pennsylvania. Two-year-old Andy loved a good scrap and had the mangled ears to prove it. His handlers were Privates First Class Robert E. Lansley, a former Marine drill instructor, and John B. “Jack” Mahoney, a teenager whose family raised Irish setters. Scout training began with teaching dogs to work silently; in combat a bark could be fatal to man and beast. Exercises gradually conditioned the animals to respond to the command “watch” by trying to detect hidden enemies. With repetition the dogs came to understand that they were to pinpoint trouble, then back off and let their accompanying Raiders go to work. Messenger dogs would stand in for Marine runners, substituting a speedy, low-profile, single-minded courier for a slower and more easily targeted human. Messengers served two masters, learning to avoid trouble and unerringly carry messages between one man and another in any weather and over any terrain. Messenger animals were prized for the affection and blind loyalty they displayed toward their handlers. Caesar von Steuben, an 81-pound German shepherd, had started out in the army. He was now three years old. In Caesar’s puppy days, the Glaser brothers—Milton, Irving, and Jerome— of the Bronx, New York, had taught him to carry packages from the corner store to their family’s fourth-floor walkup. By the end of 1942 the boys had all enlisted, so they signed up Caesar, too. After obedience and messenger training at Fort Robinson, he was transferred to the Marines in early March 1943. The muscular shepherd was teamed with Privates First Class John J. Kleeman, an 18-year-old Philadelphian, and Rufus G. Mayo, a young Alabamian who before the war had trained hunting dogs. Messenger training first desensitized the dogs to the chaos of battle. As War Dogs, Technical Manual No. 10-396 noted, the regimen exposed canine trainees to “every known distraction, such as bomb detonations, shell and gunfire, troop and motor traffic.” Handlers acclimated animals to wearing message pouches on their collars. Then, starting about a dozen yards apart, handling teams worked on “report,” the gentle command that would send a dog on its way. Repeated practice at increasing distances and over ever-rougher ground continued until a dog could easily make the transit from one master to the other over a mile of obstacles and hazards. In late April 1943 the Marines ordered Clyde Henderson’s war dog training company relocated to Camp Pendleton, California. There, men and dogs spent six weeks drilling and learning attack techniques under Carl Spitz, a Hollywood trainer who had been prepping hounds for movie roles since the days of silent film. (He owned Terry, the female Cairn terrier that played Toto in The Wizard of Oz.) “He was a pretty tough guy,” handler Jack Mahoney recalled. Another Marine handler, Kenneth Shepperd, recalled that the domineering Spitz carried a swagger stick. “He hit us if we didn’t do something right,” Shepperd said. Now the platoon’s fate was up to Marine headquarters, which, even then—in June 1943—wasn’t certain what to do with the unorthodox outfit. “Everyone looked on us as a curiosity and wondered what we were supposed to do,” Henderson said. “We weren’t too sure ourselves.” The Marines shipped dogs and handlers to New Caledonia—south of Vanuatu and the Solomon Islands in the Coral Sea, where forces were gathering for an assault in the Western Solomons—hoping some unit would adopt them. As the 1st War Dog Platoon was departing, the 2nd and the 3rd began training at Lejeune. The three-week voyage was anything but routine. The animals lived on deck in crates shaded by a canvas awning, doing their business in a sandbox latrine dominated by a hydrant-like post. Three or four times a day they ran the deck, watched by sailors so incessantly curious about their four-legged passengers that the Marines placed the kennel under 24-hour guard to assure that the dogs got enough rest. Location is everything, even in war. Arriving in New Caledonia’s capital, Nouméa, late one July night, the dog platoon awoke to find that it had been randomly billeted on the doorstep of the 2nd Marine Raider Battalion, veterans of the Makin Raid and the “Long March” on Guadalcanal. At first the Raiders scorned the green Marines and their furry friends. They cracked jokes, howled and barked, and griped that the Corps was going to the dogs. Forsyth thought the tough veterans were a little bit afraid of the animals. So did Shepperd, who remembers that when off their leads the dogs would chase Raiders who had taunted them. But as the Raiders watched the dog teams drill, they came to realize that in jungle combat the critters might be a lifesaving asset. Shapley had only a few weeks to integrate dog teams into his regiment, impart Raider culture to them, and teach his Raiders how to work effectively with dogs. To these ends, he sent dog-led patrols to be “ambushed” and carry messages, and put dog teams through amphibious landing exercises. This sold the Raiders. A messenger dog could run as fast as 25 miles an hour, a scout dog could sense a hidden human at a quarter of a mile, and neither was an easy target for enemy gunners. Two days later—on November 1—the Marines stormed the island’s western shore. It was rough going for the dog platoon; a Japanese mortar round nearly capsized Henderson’s Higgins boat. “We hit the beach and dived for cover,” he said. “All of us, dogs included.” When they reached the regimental command post, they asked for orders. They didn’t have long to wait. To slow an expected Japanese counterattack, M Company, 3rd Raiders, was to advance 1,500 yards east along Mission Trail to establish a strategic roadblock at the junction with Piva Trail. These two narrow, muddy tracks provided the only overland access to the island’s interior. Company commander Lieutenant Francis O. Cunningham chose two dog teams: Andy’s and Caesar’s. Late that morning Cunningham’s 250 Marines stepped off into the dark forest. Caesar brought up the rear, ready to rush back a message; Andy was on point, leading the column. Walking the point is a lonely, dangerous business, especially on a rough path winding through dense jungle lousy with enemy snipers and pillboxes. Andy worked off the leash, ranging 20 to 30 yards ahead to sniff and listen, hopping from one side of the trail to the other. When he detected something, he would “alert”—freeze, ears erect, facing the sound or scent. During the march up Mission Trail, Andy alerted the Raiders to the enemy three times—including to a machine gunner about to fire, giving the Raiders time to take cover. As the Marines continued, their confidence grew in Andy’s ability to prevent deadly surprises. When M Company reached the Piva crossroads early that afternoon, the men began to entrench. Raiders eagerly volunteered to dig shelters for the handlers and their dogs, to keep them nearby. “Much of the credit for the feeling of security we enjoyed that first night goes to the dogs,” one Marine said. Cunningham carried a walkie-talkie, but its signal was too weak to penetrate the thick rain forest. That’s why he’d brought Caesar, and late on the first day he sent the first Marine message ever to travel by canine courier in combat. With a quiet “report,” Rufus Mayo sped Caesar toward his other master, John Kleeman, at the command post. Caesar traversed the trail in minutes, far faster than a two-legged Marine could have. Kleeman grabbed the message from the pouch attached to the dog’s collar and sent the shepherd back to Mayo. Early the next morning a field telephone line was run to the Piva roadblock, and Caesar switched to sentry duty at the perimeter—until the enemy cut the wire. Again the messenger dog became Cunningham’s link to Shapley. Caesar made eight circuits that day, with Japanese snipers trying to pick off his dashing black-and-gray form. Late that night, after Mayo and Caesar had settled into their foxhole, the dog awakened his master—just before an enemy infiltrator hurled a grenade their way. Mayo grabbed the grenade and threw it back, killing several Japanese. Near dawn enemy forces tried again to penetrate. Caesar immediately leaped to the attack. Mayo called him back, but as the dog obeyed, enemy rounds caught him in the left shoulder and hip. Mayo moved him out of the line of fire, sprinkled sulfa powder in the wounds, and told Cunningham that Caesar had to be evacuated. The officer sympathized, but said that he first needed Caesar to summon reinforcements. The dog went limping on his way and delivered the message calling for help, but by the time Caesar reached the command post, his condition had deteriorated. Raiders quickly stretchered the big shepherd to the field hospital. A surgeon found a bullet lodged near the dog’s heart. “Too risky to remove,” he said, dressing Caesar’s wounds. It had been a close call, but within three weeks the Raiders’ favorite four-footed Marine had returned to active duty. While Caesar was convalescing, Andy continued to patrol. On the morning of November 14 he was leading a column that included four light tanks up Piva Trail. “Suddenly Andy stopped short, and looked to the right and left, the way he always alerted,” handler Bob Lansley said. “I crept up along a little trail behind him and saw two machine gun nests.” To goad their foes, Lansley let off a quick burst with his Thompson submachine gun. The enemy shot back from both sides. During the fierce firefight that ensued, Mahoney provided cover while his partner darted from tree to tree, firing at the Japanese positions. When Lansley drew close enough, he chucked a pair of grenades at the dugouts, eliminating resistance. “It was the most heroic thing I’ve ever seen,” Mahoney said. Andy’s warning had helped save Marine lives. Combat correspondents got wind of Caesar and Andy, and soon they were making headlines at home. “Caesar Is Helping Take Bougainville,” reported the New Orleans Times-Picayune. “Four-Legged ‘Devil Dogs’ Win Marine Corps Praise,” said the Canton, Ohio, Repository. The Omaha World Herald went over the top in a story about Caesar: “Veni … Vidi … Vici. He came, he saw and he is helping to conquer.” Commandant Holcomb wrote letters of commendation to six war dogs’ former owners. His communiqué to the Glasers read, “Caesar made nine official runs between the company and the command post, and on at least two of those runs he was under fire.” Andy, too, was commended, for having “led the advance on the initial day, and warning of scattered Japanese sniper opposition on many occasions.” To honor their outstanding performance, Holcomb promoted all six dogs to the rank of corporal. In his after-action report Shapley lauded his dogs’ performance. “The War Dog Platoon had proven itself to be an unqualified success,” he wrote. 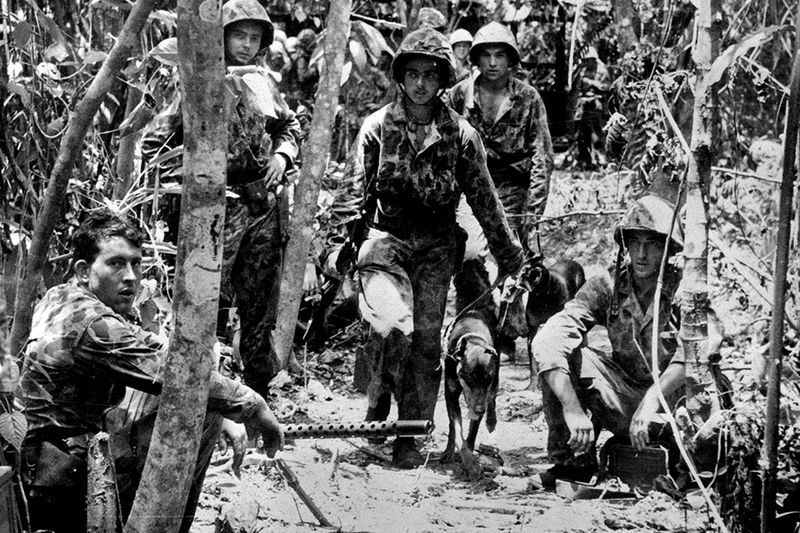 “They were constantly employed during the operation, and proved themselves as messengers, scouts, and agents of night security.” Henderson, who returned to Lejeune to pass along lessons learned, told a reporter that the “program will be expanded and will go ahead under full steam.” The 1st War Dog Platoon had earned itself a place as an integral element of the Marine Corps. As the war shifted into its final phase, more dog platoons— there were now seven spread among the six Marine divisions— served in the battles for Guam, Peleliu, Iwo Jima, and Okinawa, and were among the first American units to occupy Japan. After Japan’s surrender, surviving dogs returned to Camp Lejeune. Nearly half of 1,074 enlisted Marine Corps dogs saw action. Of those, 58 died, 29 in combat—25 on Guam alone. The greater toll was on the dogs’ health. Infections, parasites, malnutrition, and dehydration struck hundreds of dogs. Shellshock and gun-shyness rendered many unreliable. The Corps kept damaged dogs from combat, and euthanized 128. No longer of military value, the rest were in line to get the needle, too. As 3rd War Dog Platoon commander Captain William W. Putney recalled, headquarters believed “there was no time for any other solution.” Putney protested. “Time, now that the war was over, we had plenty of,” he wrote. “There simply was no good reason that most of our dogs could not be rehabilitated. The dogs deserved the chance to respond to a program of detraining aimed at preparing them for a return to civilian life.” The Corps approved, and Putney oversaw a mustering-out program, leading to 540 of 559 Devil Dogs being sent home. Handlers, who had forged a battle-tested bond with these animals, were allowed to adopt them. However, Andy and Caesar, those first two Devil Dog heroes, did not come home. Two months after leaving Bougainville, Andy died on Guadalcanal. Nearly deaf, he failed to hear a speeding truck. A heartbroken Bob Lansley wrote in Andy’s service book that an outstanding point and patrol dog had died in the line of duty. Caesar saw combat at Guam and then in northern Okinawa, where on April 17, 1945, the big shepherd—that slug from Bougainville still close to his heart—was killed in action. Originally published in the April 2014 issue of World War II. To subscribe, click here.